2 weeks ago a bride sent me an email asking if I would make her a wedding cake. She was having a small wedding and had only just decided to have a cake. Well maybe she was talked into having a cake. Regardless of how it came about she asked me if I would sculpt her a Panda playing a Ukulele. Of course I said no. 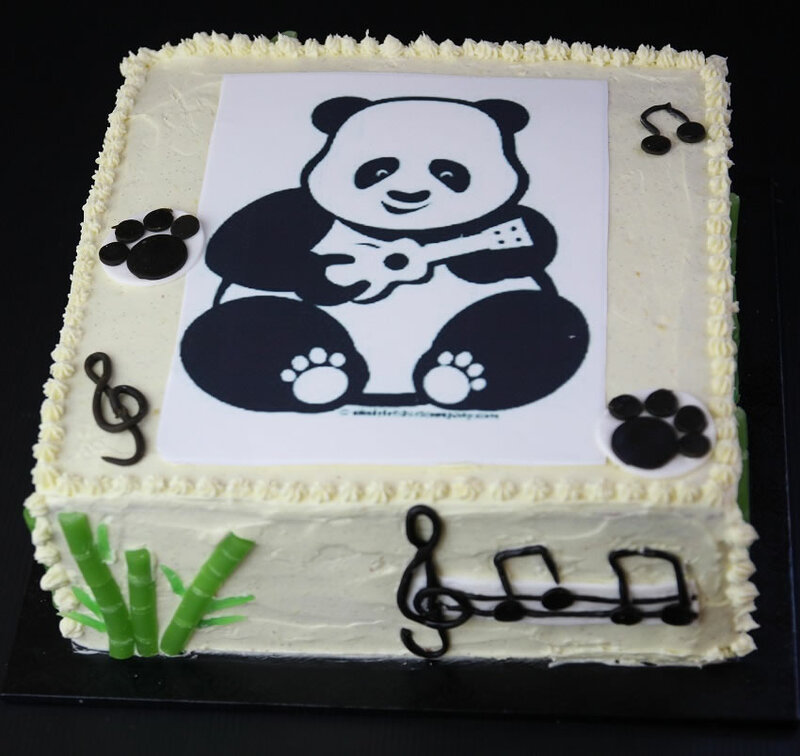 Her husband to be is a wonderful musician who plays drums and Ukulele and she just loves Pandas. 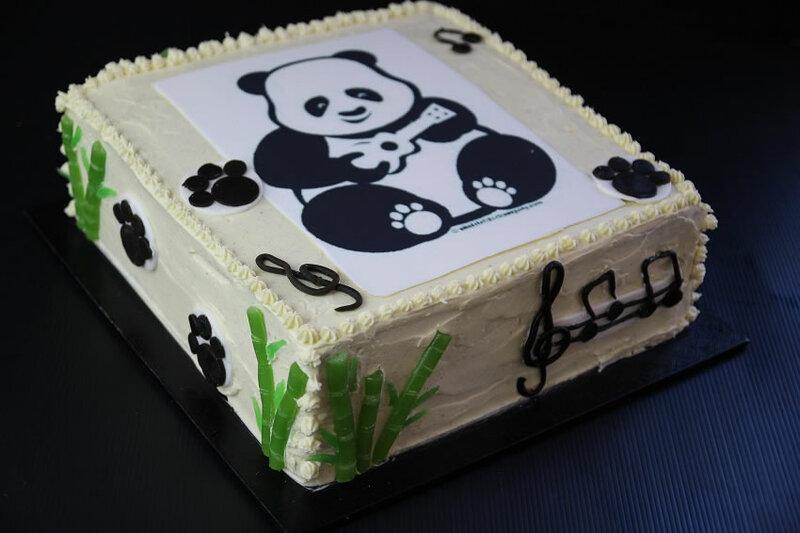 I am not experienced enough to be sculpting Pandas playing Ukulele’s for a wedding and I didn’t want to see her cakeless, I just love an unusual notion, so I got cracking on an alternative. I was busy on another project during the week so I asked her to send me a picture she liked and I had it made into a sugar image at Cake decorating Solutions in Roseberry. This is a 6 layered red velvet cake because the colours of the flowers and the table decorations were a berry shade. We didn’t want it to be too sweet so I made quite an unusual recipe for a red velvet cake. The layers are separated with raspberry buttercream and then covered in a vanilla cream cheese icing, I wish I could show you the inside. Beat the eggs and sugar till light and aerated. Add the oil and beat more until light in colour. Add the apple puree, vanilla, spices and sifted dry ingredients and mix well. Add the red colouring a spoon at a time until you get the colour you would like. It will be an orangey colour that will be corrected to brighter red with a little addition of blue. Pour into a greased and lined tin and bake for approximately 40-60 minutes. Beat the softened butter till light and fluffy. Add the jelly crystals, vanilla, thawed raspberries and beat in 1 cup of sugar at a time.Add 1/4 teaspoon of salt at a time till you have a fluffy buttercream that isn't too sweet . Once the cake is baked and cooled slice and layer with the raspberry buttercream filling. Chill for 1 hour. While making the cream cheese icing. Spread this onto the out side of the cake smoothing with a palette knife. Chill for several hours or over night before decorating any way you like. I wish I could see inside too! I would have loved to have seen you attempt a panda playing a ukelele. That’s Cake Boss kind of stuff! That cake is so damn cute, it’s got character and charisma. Don’t think I’ve ever said that about a cake before. I love the solution you came up with! What a fun project and I am sure the bride and groom were over the moon by this! The cake looks amazing, Tania. I wish you had a photo of the inside to see the 6 layers. Hopefully the bride was kind enough to get a photo for you! wow a masterpiece, Tania. The licorice bamboos are so vivid. That is the cutest thing but so unusual for a wedding cake. I wish I could see inside it but I guess that would ruin it. Oh yum, love the sound of that raspberry buttercream! And such a cute cake! What a terrifying request to get 2 weeks out from the wedding! You did an amazing job on what you did create and I am sure they loved it. 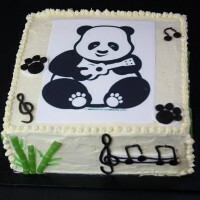 I’d faint dead away if someone asked me to make a cake with a ukelele playing panda. Your cake is wonderful and I wish we could have peeked inside too! 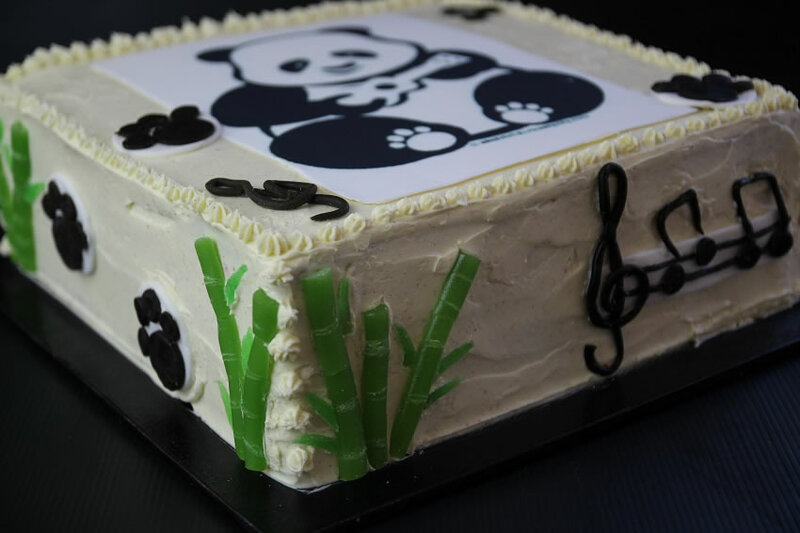 You are one talented cake decorator, Tania. This is a beautiful cake and what a surprise to cut into it and find 7 layers! And you made it in 2 weeks? Well done! I did a double take reading that how totally random! So impressed you came up with a solution for the bride-to-be. Weren’t you just a little tempted to cut into it and then buttercream it all back together? This is a special cake! I would love to see the inside, you have done and amazing job! great looking cake! Thanx for posting this. One question only: in the ingredients baking powder is mentioned twice. Shouldn’t one of the two be baking soda?